3M Peltor MT Series High Noise Two-Way Radio Headsets are designed for use in the most demanding industrial and commercial high-noise environments. 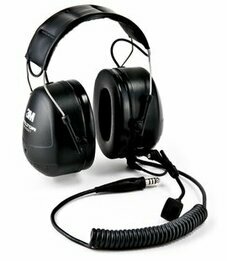 Whether you need a comm headset that will perform in your high noise environment in manufacturing, processing, heavy equipment operations, aboard ship, in or around aircraft, logging operations, and even in oil, gas and coal extraction and processing, Peltor MT Series headsets offer the specific solution you need. Peltor's quality and unparalleled feature set make the Peltor MT Series Headsets a top recommendation when you need reliable communications in high noise environments. Peltor MT Series 2-way headsets are available for use with virtually any two-way radios you may already have. The standard models are all equipped with a fixed downlead that is terminated with a robust TP-120 male plug. The TP-120 plugs into a push to talk (PTT) adapter (PTT sold separately), which in turn, plugs into your two way radio. In this configuration the TP-120 plug also provides quick disconnect functionality in emergency situations. Peltor MT Series 2-way headsets are also available with a hard-wired downlead terminated with the specific connector to directly connect to selected Motorola, Cobra E.F. Johnson, Harris, Icom, Kenwood, and Midland radios. Peltor offers two options: standard models that requires a PTT adapter that plugs into your radio, and direct wired models that connect directly to your radio. The direct wired models are a little less expensive than buying an equivalent standard model plus a PTT adapter cable, but the two piece option can save money in the long run. The most common failure point is at the radio plug, and a damaged plug at the radio end means you can simply replace the PTT adapter cable rather than having to pay for expensive repairs as will be needed if you choose the direct wired option. The PTT adapter also gives you a handy PTT activation point that can be clipped to your body wherever you prefer, while the direct wired model requires that you activate transmission by pushing a button on the radio. Model numbers for the Peltor MT Series two-way headsets and the radios they connect to are shown in the table below. Please scroll down the page to order the MT Series headset you need. Ear cups are extra deep with liquid/gel filled ear pads for maximum comfort and high level noise protection (NRR 25). A durable noise cancelling directional boom mic lets you clearly communicate in high noise environments. Strong and durable fixed downleads provide connectivity to your radio and support full two-way communications. Choice of standard model headset that requires a separate PTT or a direct connect model that plugs directly into your radio. MT7H79P3E (Hard Hat) A Standard Wired PTT Adapter Cable is Required to connect these MT Series headsets to your radio. See our 3M Peltor PTT Adapter Reference Table to identify the model PTT adapter you will need. A Standard Wired PTT Adapter Cable is Required to connect these MT Series headsets to your radio. See our 3M Peltor PTT Adapter Reference Table to identify the model PTT adapter you will need. ATEX Compliant Intrinsically Safe Headsets Require Standard Wired PTT Adapter Model FL5230. ATEX certified only when used with FL5230 PTT adapter for Motorola GP320 and 340 Radios.